A new video has emerged of a Samsung Galaxy S4 running Android 5.0 Lollipop, the latest version of Google's mobile operating system. We recently saw a video of the Samsung Galaxy S5 running Android 5.0, which was leaked by Sam Mobile. The same website has now got a video of the older Samsung Galaxy S4 running Android Lollipop. 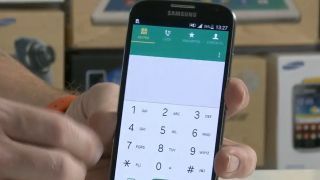 The video shows what Galaxy S4 owners can expect, with Samsung's TouchWiz user interface updated to reflect the new 'Material Design' style of Android 5.0. As with the Galaxy S5, Samsung's TouchWiz interface and its redesign also stretch to its system apps as well, with the phone, messaging, contacts, calculater, clock and more all having a facelift to fit in with Android 5.0's new aesthetics. The version of Lollipop running in the video, which can be viewed below, is an earlier, incomplete version named LRX02E. This means there are still a few bugs and quirks that won't be present when Galaxy S4 owners finally get their hands on Android 5.0.